With the start-up of school we Moms are busy, I mean super busy. Whether you homeschool or not there is a lot of busyness in the start-up of school. But despite all that you still want to engage your kids, play with them, and at times keep them occupied so you can tend to something else. 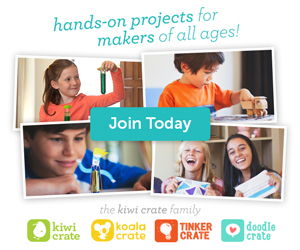 Grab a Kiwi Crate (or two) to have on hand! 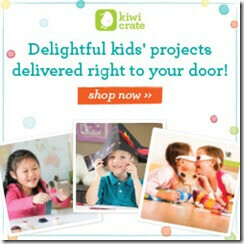 Kiwi crates all include everything you need to complete 2-3 fun, engaging projects. They are geared at kids 3-8 years old. And from a Mom who has some of these on hand let me tell you – these are GREAT! Our favorites have been – the Castle, Spy, Music, and Kalidascope kits.